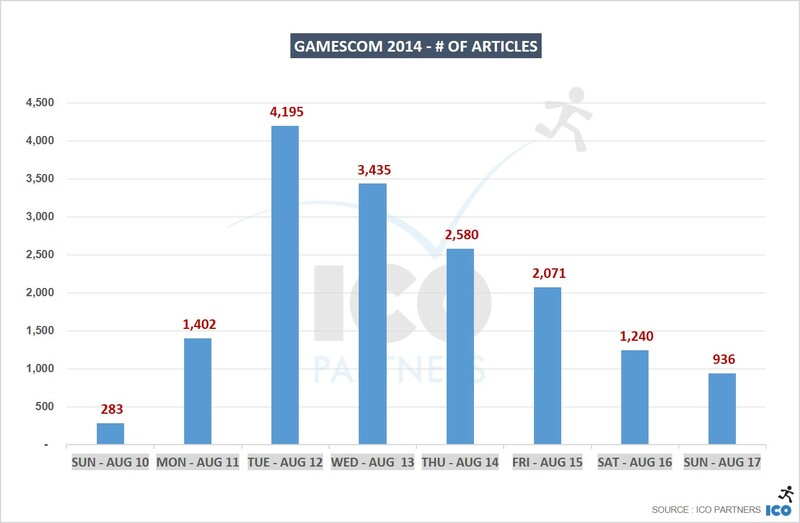 PR monitoring – What is the impact of gamescom in the media? 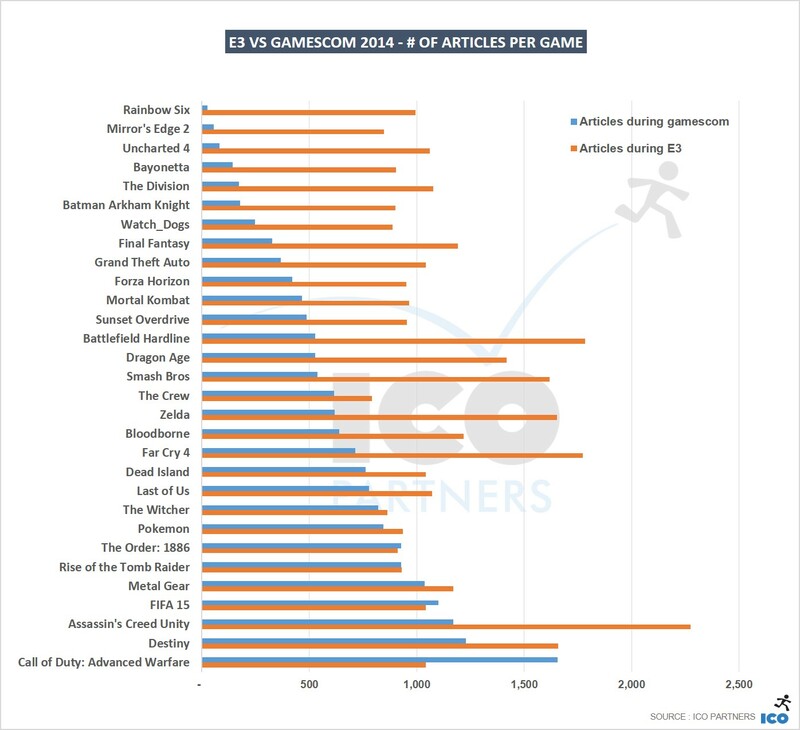 In a similar fashion to the E3 blog post, I want to analyse to the impact of gamescom in the media. All the data presented has been taken from our media tracker. Before I begin though, some context is necessary. gamescom (without the capital G, that’s important to them) was a video game event set from the 13th to the 17th of August in Cologne. While E3 is very much a professional event, gamescom is both B2C and B2B – with a significant part of the later dedicated to interact with the media. Similar to E3, the week was kicked off by a couple of press conferences from Microsoft and Sony. The proximity from E3 and the place in the calendar (a few weeks away from the first launches for the “holiday season”) mean those press events/media briefings are very different from their E3 counterparts. They usually echo reveals that were made at E3 and have a few of their own exclusive announcements, but by and large, they are not seen as exciting as those made in Los Angeles. 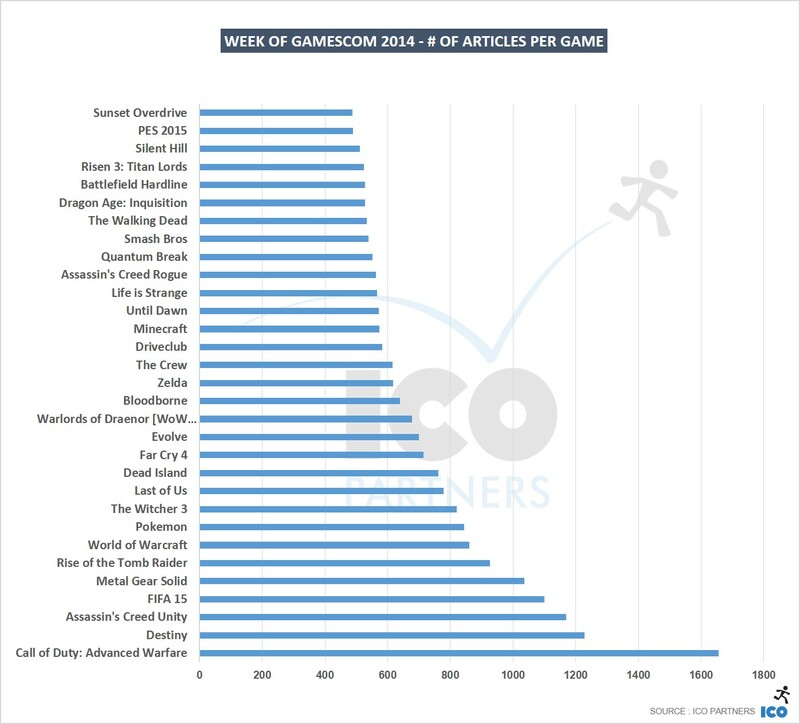 When I started digging into the number, I had in mind to compare E3 and gamescom – but the nature of the events (and perhaps more importantly) their timings mean it is hardly fair and not really possible across everything we track. I have tried to use some comparisons where applicable, but also looked at the event on its own as much as possible. The nice thing with gamescom when it comes to our media tracking is that we can find articles mentioning the event itself rather easily (which we can’t do with E3 for instance). Over one week, there were 16,642 articles mentioning the event. The peak day being the Tuesday (the day of media briefings event from the two largest console manufacturers and their reveals). On the Wednesday, the B2C part of the event is opened to professionals only and (along with Thursday) has the biggest part of the press presentations (including the EA press conference for instance). By Friday, the B2B area is slowing down significantly, the B2C is no longer easily accessible and a lot of professionals (including media) are on their way home. While it is obvious that it is a very German event (almost 30% of all the coverage it generates is published in Germany), there is still a significant relay across all the others Western territories. If you compare to the July numbers, it is clear that the gamescom has a positive effect on the amount of coverage, especially when you consider it happens in the Summer in Europe (and with many people on holidays). It is also obvious that while beneficial, the impact is not comparable to the one the E3 has. 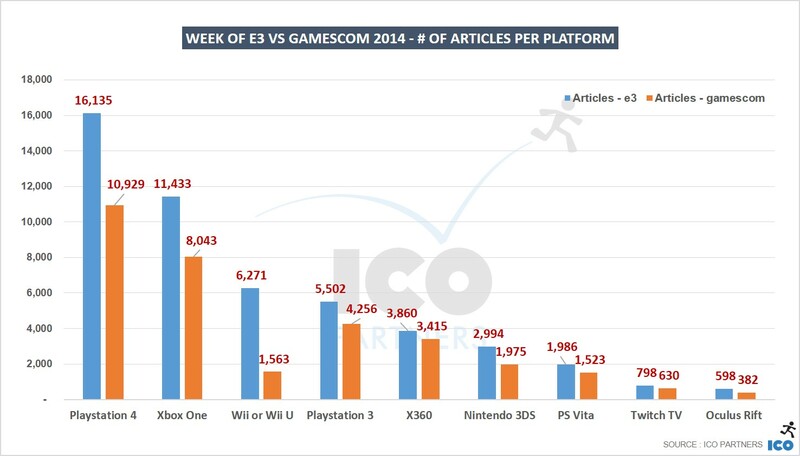 You can also see the impact of the press conferences, in the case of Nintendo that didn’t have one for gamescom (while their E3 one had fantastic results): during E3, about 13% of the articles on platforms mentioned the Wii consoles, that fell to 5% for gamescom. 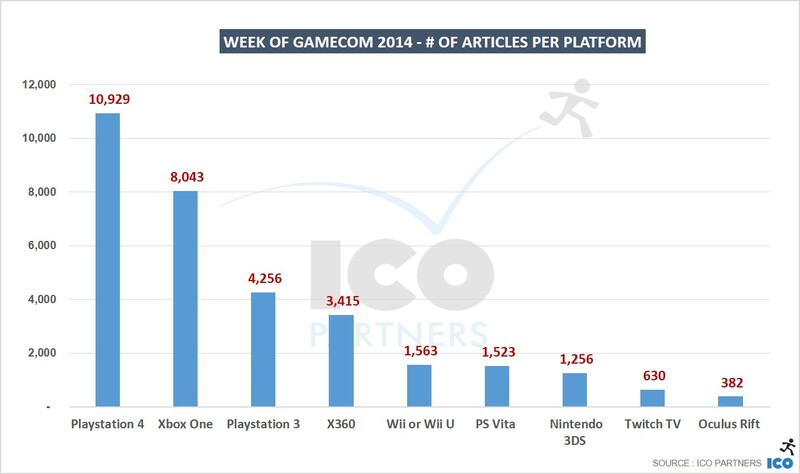 This is an impressive counter-performance after a stellar (IMHO) coverage at E3. The fact that the 3DS coverage drop was in line with the other consoles might hint at the fact that Nintendo focused on their handheld titles during this show – I still see it as a missed opportunity on their part. There are more articles in German than in other languages around both events. That’s consistent with the German media landscape that is more varied. 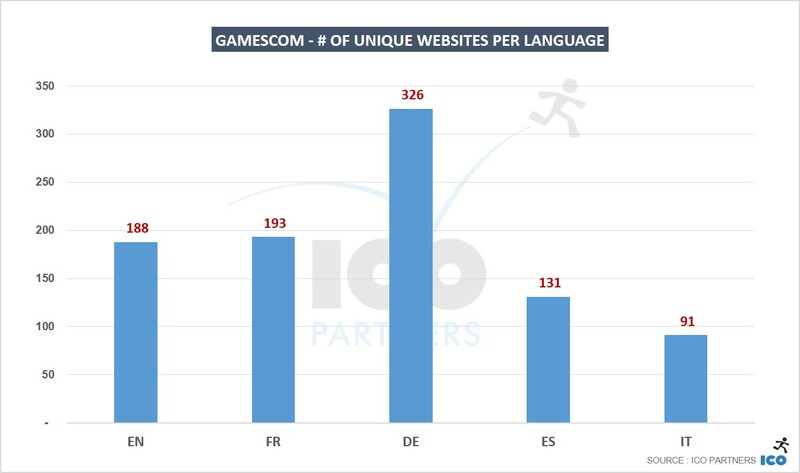 In English, Spanish and Italian, E3 generates between 55-68% more coverage than gamescom. 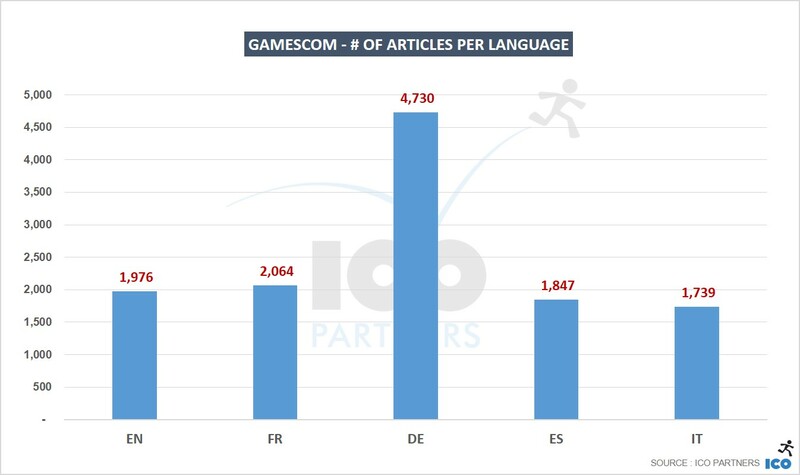 While it is expected for German media to give a lot of weight to a local event, it is interesting to see that French media (proportionally) cover gamescom more than English, Italian or Spanish media. 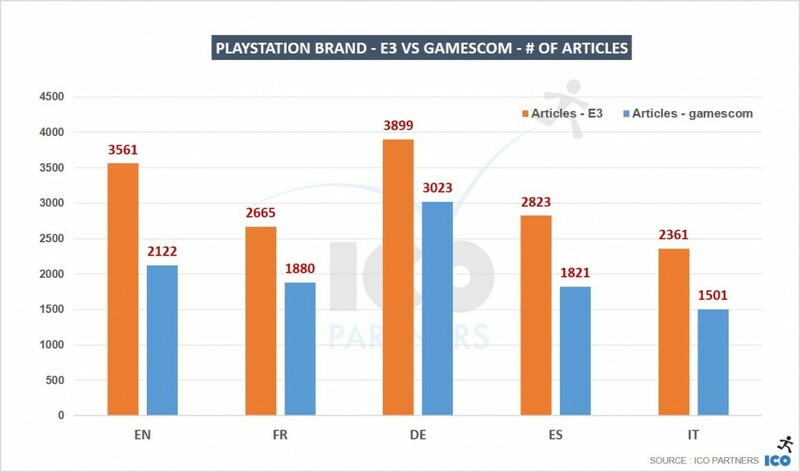 Running the same comparison on the Xbox brand is bearing similar results, with the notable exception of the English media: their drop-off between E3 and gamescom was smaller for Xbox than for Playstation which is in line of the Xbox brand being stronger in the US and the UK than on continental Europe. The biggest difference between the two events lies in the games’ release dates – while Uncharted 4 is announced at E3, gamescom being a consumer event first and the game not being shown there, it has no presence. On the flip-side, Fifa 15 and CoD:AW which are both year end releases have a much more significant presence – they both have a strong showing on the B2C side and a corresponding push in terms of PR. 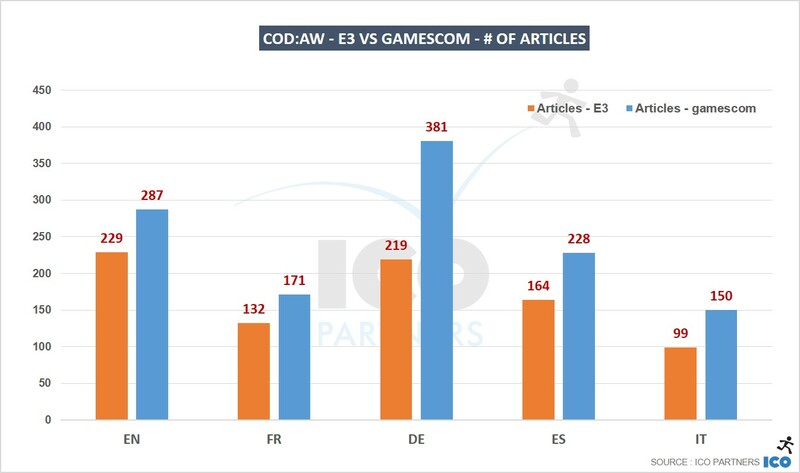 Using COD:AW as a first example, we can see a strong proportion of the extra coverage is coming from the German media, but it is also true that the game overall got covered more across all countries. Using Rise of the Tomb Raider as a second example is equally interesting. During its press conference, Microsoft announced that they had secured a (timed) exclusive for the game on Xbox… This was seen as a bombshell, the franchise has a long history with Playstation and an exclusive for such a high profile game is very rare in our day and age. The game had been announced at E3, and this arguably one of the most covered news in the life of a game. 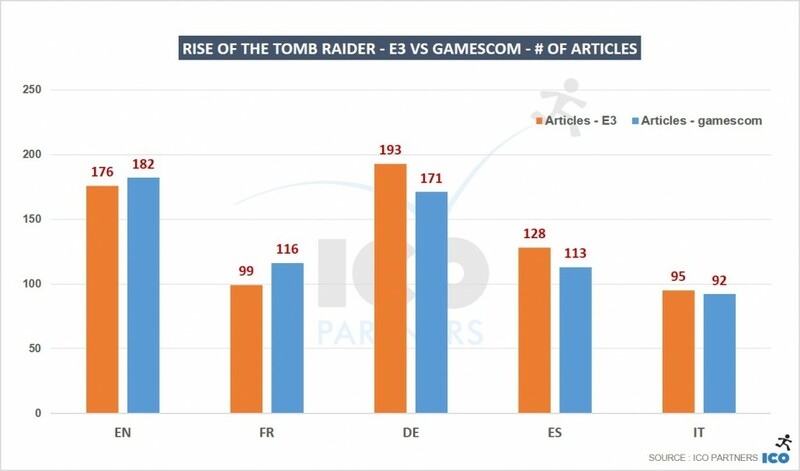 Now, looking at the fact that the game received more or less, the same amount coverage at the two events, across all the languages is very interesting: ultimately, gamescom has grown to a point where key announcement are as well relayed as if they had been made at E3. For 2015, gamescom has announced its dates for slightly earlier in the year (and more in line with the one of feu Leipzig’s Game Convention). That will mean it is further away from the “holiday season” and its bells and whistles focused on games about to be released. It will also be closer to E3 dates… It might be an opportunity to get a few more exclusives and get more of the media attention again. In July, Bethesda promoted all its games during QuakeCon, making quite a few interesting announcements there. This past weekend was the Penny Arcade Expo (Prime), a show firmly oriented B2C. At the event, (Germany-based) Deep Silver announced the new Saints Row game – an announcement that could have easily been done during gamescom. Somehow, announcing the title outside of the noise of another event was seen as preferable. https://icopartners.com/newblog/wp-content/uploads/2014/09/gamescom_purple.jpg 256 710 Thomas BIDAUX http://icopartners.com/newblog/wp-content/uploads/2017/08/ICO_logo_022.png Thomas BIDAUX2014-09-02 09:50:502014-09-24 11:29:26PR monitoring – What is the impact of gamescom in the media?